Note : This is not a sponsored post. DinoBoy's Chinese language standard is not as great as I wanted him to be nor is it as good as his English language. 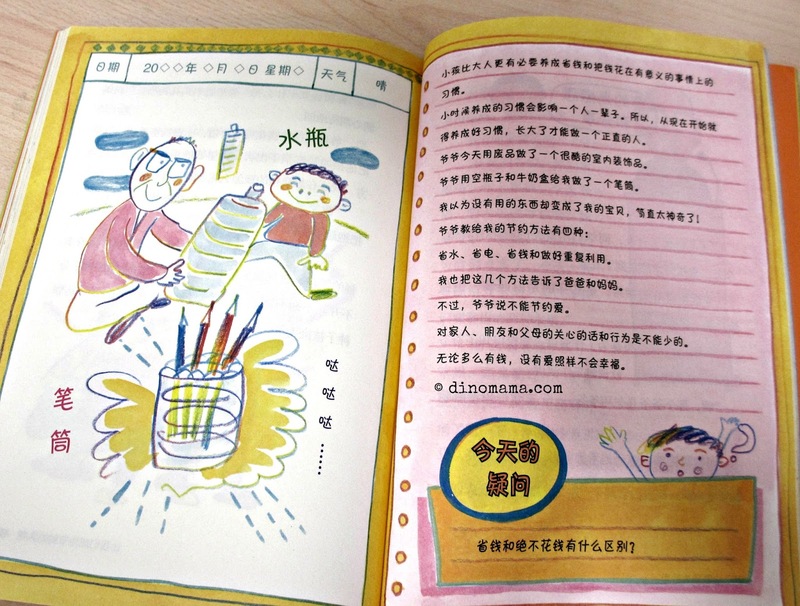 Since he started his primary school journey I have pushed doubly hard on introducing more Chinese story books to him and ensuring that he read much more Chinese story books than before. Since many parents have voiced out that their kids are struggling with the language, I thought I'd share the books that I exposed DinoBoy to since day one in primary school. 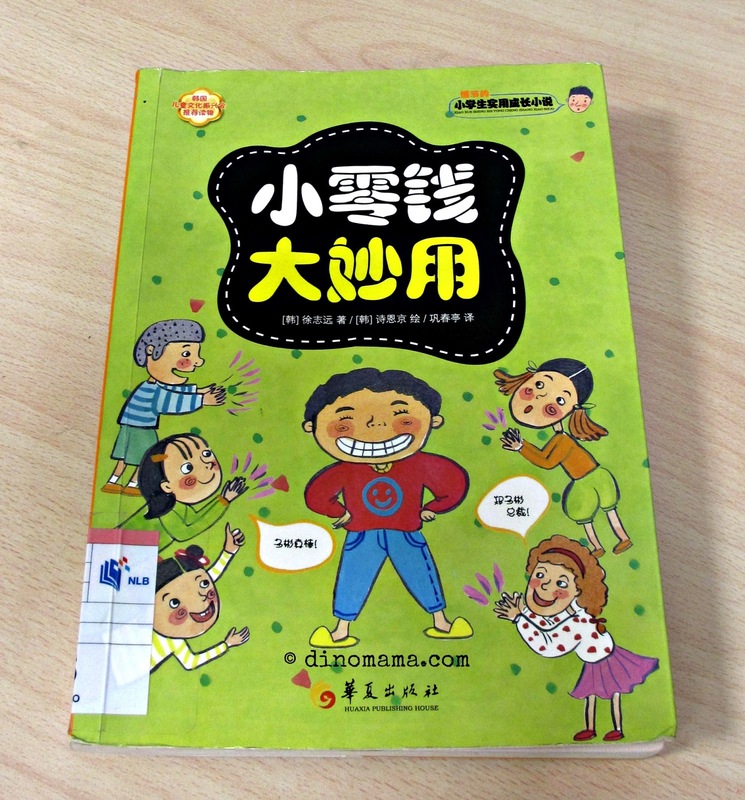 I hope these books will help parents choose the ones that are suitable for their kids' reading level and eventually help them conquer Chinese. 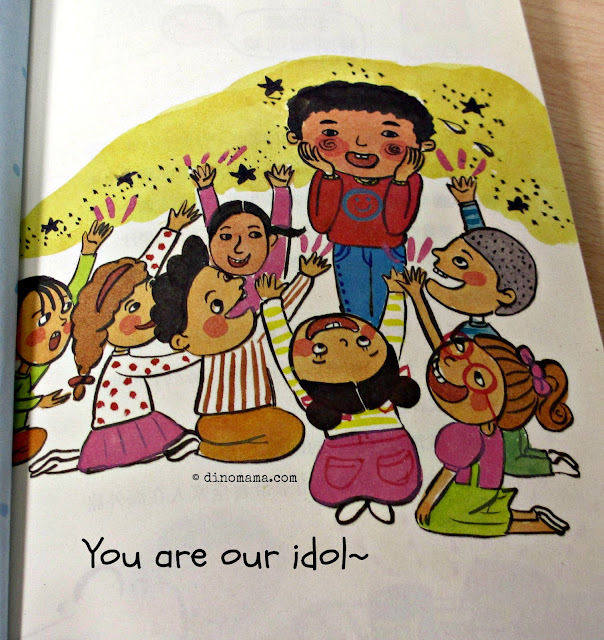 I saw this book at my favourite spot in our neighbourhood public library, at the Recommendation Corner (that's what I called it). Since I taught DinoBoy about money awareness earlier this year I thought this book will further enforce what he knew or learnt so far. I especially like this book because it touches on the Entitlement Syndrome so commonly found in kids these days, they wanted the latest electronic gadget, the more toys the merrier, actually the more of every thing is the best. They do not cherish the things their parents bought; sometimes with their hard earned money, and perhaps think that they deserve every thing they lay their eyes on. So the story started off with Duo Bin 多彬 and his parents doing their grocery shopping in the supermarket. At the check out counter they discovered that besides the usual household and food items each of them have put items that they may or probably would not have any use of it into the trolley. Things like medicine for ailment for older people or 10 bottles of shampoo just coz it was on promotion or even hair dye product. Instead of removing them from trolley, they buy them giving excuses that they may have a use of them in future. The story takes us from the supermarket scene to Duo Bin's school where he tries to show to his classmates how rich his family is by giving gifts to his classmates and treating them snacks, from there it was also slowly revealed that Duo Bin's wish is to become a millionaire, living a lavish & chic life and to spend money like water. The story also revealed his unrealistic idea about money and that happiness & loyalty will comes along with it. I think most people harbours the same thoughts too for the longest time. 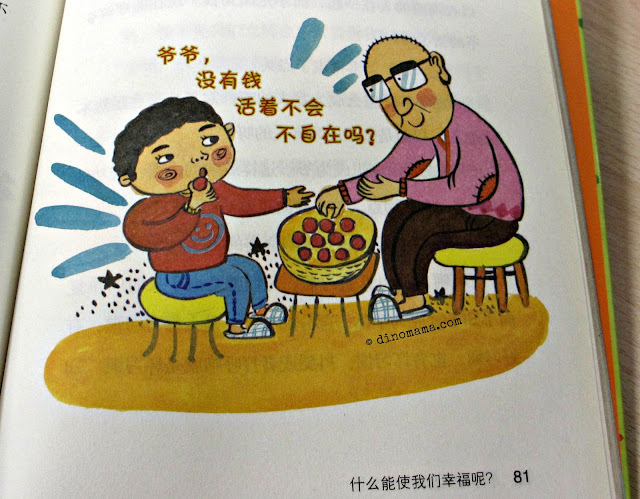 Duo Bin learned it the hard but educational way about the true meaning of money, wealth and happiness from an elderly gentleman whom the kids called him Grandpa Beggar because he was dressed shabbily and was seen always picking things up from the recycle bins. It turned out that this elderly gentleman is not only rich but is famous too (never judge a book by its cover eh?) and he's been living frugally. We set aside an hour each day for our bedtime reading and we spent a few days reading the each chapter because it is quite a wordy book with words & idioms that DinoBoy is not familiar. We also discuss about the many misconception of money & wealth by the main characters. 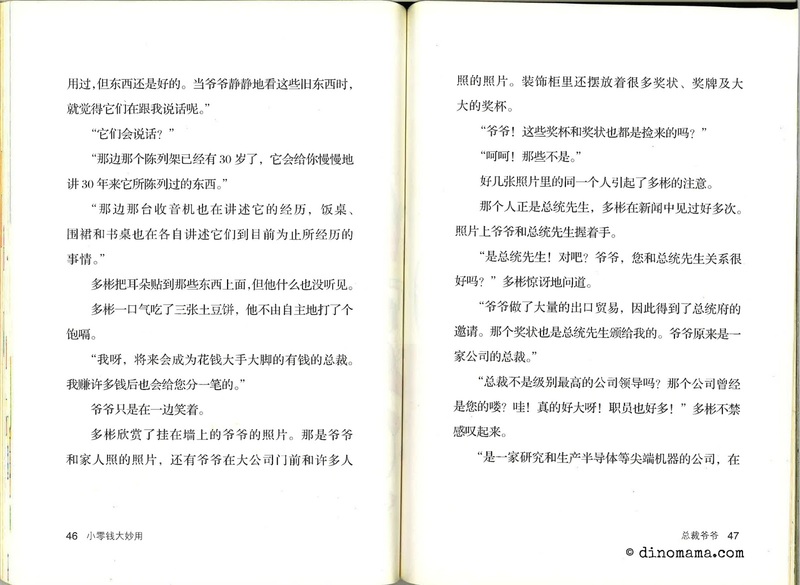 This is how the inside of the book looks like, a handful of the pages are filled with of words and some in long sentences. The other pages will have some illustrations on it or full page illustration like the photo above. Things like using credit cards which I explained to him that it is consider future money because we are paying for things with the money that we do not have now and pay for it when we have the money (salary) when we receive the bill. We discuss the danger of spending future money, what if we over looked and over spent? Then we will either have no money for our daily expenses or we have to pay a high interest rate per month which rendered the food we enjoyed or things we bought at that time more expensive than before. So it is best to buy things that we truly need them necessarily and to pay for them using cash, in this way we will be get ourselves into unwanted or unforeseen debts. We also talked about the pros and cons of credit cards, yupe there are pros in using credit cards too, such as during holiday in another country, instead of carrying wads of cash, a card would be a safer option. I like that at the end of each chapter there is 2 pages of Duo Bin's diary, writing down the day's event which are written in short simple sentences, some are good thoughts and some are misconception and we talked about that. Such as when Duo Bin wrote in his diary "将来， 我要赚很多的钱， 随便花。In future I will earn a lot of money so that I can just spend them as and when I like." What do you think is a more appropriate way to motivate one to earn more money? I also like the yellow bubble section at the end of the page where he will ask himself a question for him and readers to ponder upon. Don't worry if you are unable to come out with a clear and appropriate explanation on the questions asked because you can find the answer at the end of the book. The recommended age group for this book is 11 to 14 years old but I think younger kids of age 8 to 10 years old can be exposed to the contents of the book. 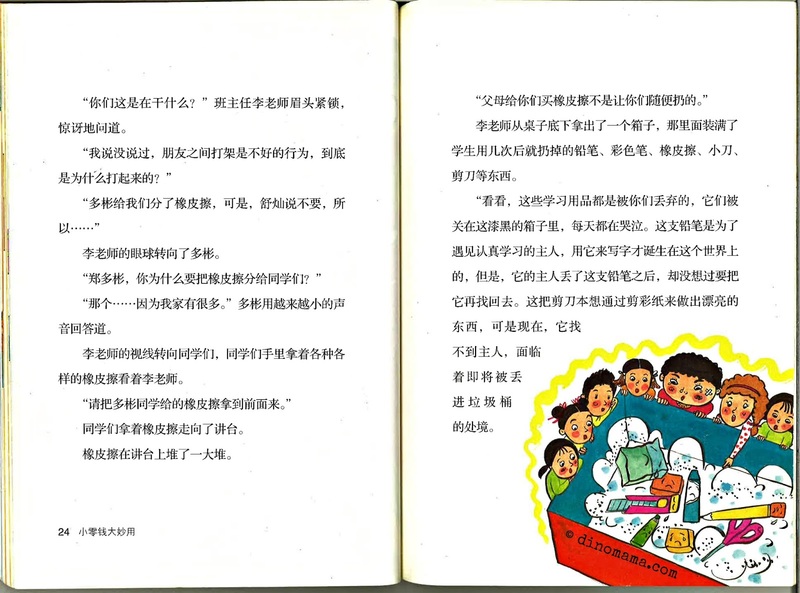 Although it is a chapter book, the words used are a little bit challenging for their age plus the chapters are long so to keep them interested in the book perhaps you can read a loud to them a page or two at a go, have a short discussion after that.